A round-up of all improvements and changes to the Buzz platform in version 2.0.95, available on March 23, 2017. 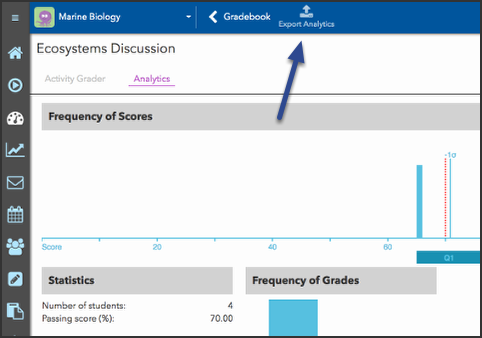 In this release, we gave teachers the ability to Export Analytics for activities from the Activity Grader. In this release, we updated the Main Menu styles to allow lowercase letters. Fixed a typo in the error message informing users that they are unable to upload an image file. Fixed an issue that would scrub some content in a question when a media item was inserted. Changed the way visibility options are displayed in the Activity Editor > History tabs. Fixed an issue that would automatically convert a question to a question bank when the word Bank (with a capital B) appeared in the question text. Updated the import grades function to better support letter grade imports. Updated question rubrics, so they no longer accept invalid number entries in the Points fields. Please leave a comment about how this article failed to help you and/or how we can improve it. Thank you! Some new icons and some new looks!